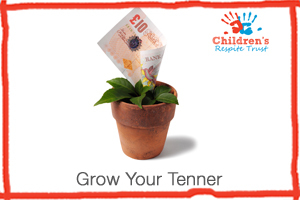 The Children’s Respite Trust is rapidly approaching Grow Your Tenner Month (May). This mean’s we’ll be giving money away. The catch, though, is that we’re asking participants to turn their tenners into even more funds for the Trust. Schools, companies, clubs and individuals are getting involved and we’d love you to get on board with it too. On 1st May we’d like to be giving out as many £10s as possible, because the more we give out, the more the Trust will get back in funds raised. The event will be going on across Surrey, Sussex and Kent throughout May. You could hold a bake sale, a dress down day or take on a sponsored challenge. The possibilities are endless. Check out our fundraising page about the campaign to find out more about how you could get involved or call us for a chat about your ideas on 01825 817417.